Inside, past the bar, beyond a few regulars, there’s a passageway rimmed by band stickers leading to the cafe’s inner sanctum. It’s a big, hot room with red walls filled with around 50 guys, and it smells like college — a subtle potpourri of oily comfort food, a hint of tobacco, maybe weed and the yeasty smell of light beer. They sit in tight rows, hunched over multi-colored controllers leftover from a different decade, cemented in front of old, bulbous box TVs that murmur chirpy orchestral hits like “Dream Land 64” punctuated by the occasional shout. This cadre of men and boys is trained to fight, to compete in Super Smash Bros. Melee, a nearly 17-year-old video game that was never meant to be competitive. They’re stone-faced, plugged-in and still, except for their fingers, they dart in spasms — green, red, green, green, green — maneuvering the clunky devices like extended limbs. Some are 14, even younger than the game itself, while others are in their 30s, raised on a healthy diet of early Nintendo. Why spend days, even years, on an outdated game? And why show up to play it in some hot bar in Oak Park? In Smash, you’re forced to battle in-person, not from behind your keyboard, and unlike a controversial game like League of Legends with its fair share of haters, Smash is lauded as a classic. “It’s almost like a drug… I don’t know when it clicked for me, but all of a sudden I just couldn’t drop the game,” says Michael Pigford, one of Sacramento’s top Smash players, also known as Smashers. Thousands, from the U.S. all the way to Japan, would agree with Pigford. Competitive Melee is a big deal in Sacramento and worldwide, with prize pools as high as $50,000. Though at first glance, it’s hard to see why there's such a fuss for a game so old, players organize Smash’s history into distinct periods (luckily, we’re out of the 2008 Smash Dark Age). In tournaments, two-play characters from across the Nintendo universe to battle on themed stages. Some matches it’s Pikachu and Princess Peach tumbling across an island in the sky backdropped by rainbows, other times it’s atop a floating purple octagon in space. It’s like a Harry Potter/Star Wars mash-up but for gamers. It's two worlds colliding in some massive wizard-filled space opera, wherein Voldemort and Darth Vader conspire to take down not just the wizarding world but the whole galaxy. For Nintendo lovers, that’s what Smash is: a delicious fusion universe with all their childhood heroes. But the objective remains simple. Mash buttons fast enough, strategically enough to knock, launch and kick your adversary, say Pikachu, off the flowery island and high into the rainbow-filled sky where he’ll fall off the screen and die in an eruption of sweet, sweet volcanic flame. But underneath the oversaturated, playful two-dimensional surface, there is a myriad of complicated techniques or “techs” — wavedashing, chain grabbing, dash-canceling — which involve complicated button strokes that take weeks, even months to learn. And that’s why people are playing this game 17 years later. Unlike many fighting games, players are still coming up with new techs. “That’s the concept of the game, how deep it goes and how much you can really speak your own language when you’re playing … It’s you on the screen,” says Josh Gagne, who’s played competitive smash for more than 10 years. The multitude of options — Gagne estimates 12 options per second — provide an almost one-to-one experience, a pure transfer from brain to controller to character. Matt Perez, who’s frequented the tournament since its inception two years ago but is admittedly not good at Smash, says that’s partly why the game is an escape. “I had a lot of depression problems, a lot of problems with anxiety, and now when I know I can go to a tournament and just have fun with my friends and play the game that I love, it just helps a lot,” he said. Nearly everyone at Cafe Colonial agrees Smashers are family. Perez has “lifelong friendships” who have emerged from Smash. They’ll post on Facebook and meet at each other's houses not to practice Smash, but just to have a drink and party. They even call Anna Gaitan, the Cafe’s general manager and co-founder of the tournament, Cafe Mom. “It’s a family getting together on Sunday, playing video games together, talking smack, but still hugging each other at the end of the day,” she said. Parents, Gaitan adds, are so comfortable with the community they leave their 13 and 14- year-old kids there alone. In an age notorious for online multiplayer trolls, Smash emerges as the generally upstanding, if not sometimes crass, grandpa of the gaming world. “You’ll notice that,” says Alan Moore (no relation to the writer), a newcomer to the Sacramento scene but arguably its best player according to past rankings. “Without the anonymity of the internet, people aren’t going to be sh*tty,” he says. Because Melee is from 2001, the game went years without multiplayer. Only recently, after a group of players developed an online emulator where players can use their computers to compete, has the game developed an online platform. But netplay is glitchy, so there’s still no real substitute for a face-to-face brawl. “You’re forced to be around [Smashers] constantly, so it’s a dynamic of just constant familiarity,” Gagne says. But family dynamics cut both ways. Spectators will jab at players as they struggle, shouting things like, “You can actually try now,” or they’ll throw out a simple “F*ck you,” which is partly why a lot of Smashers wear headphones when they play. “When you’re family, you pick at each other,” Gagne explains. 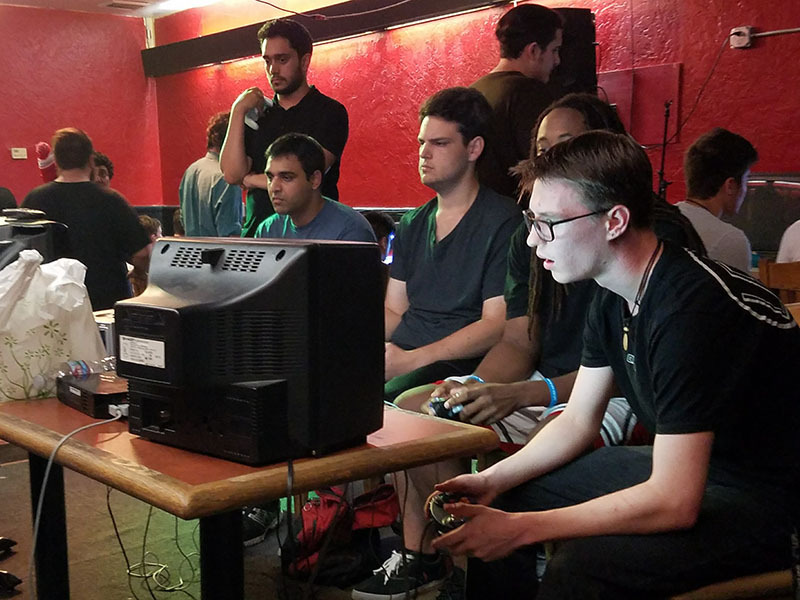 Because Sacramento is the hub for the entire central valley, with tournaments at other venues and at Smashers’ houses, it’s an insular group that doesn’t travel often to other cities or states for tournaments, and that shapes the community. “You know how to get on each other’s nerves … that’s just because of the constant exposure to each other and not traveling out so much,” Gagne says. But beyond Sacramento, competitive Smashers are part of a vast online network of players despite the lack of a robust multiplayer. Alex Ward, a Smasher visiting Cafe Colonial from North Carolina who’s competed in 30 cities, found the event on the Sacramento Smash’s Facebook group, which has over 1,000 members. “One of my friends described the Smash community like the Illuminati because whenever I travel, I just find Smashers to stay with,” Ward said. As it nears midnight at the Cafe, as it nears four hours in that hot, red room, you can’t help but see that Smash — the game, the players, everything — is different.